Pastor Swinney accepted Jesus Christ as his Lord and Savior in the mid-nineteen seventies. Later, he was called into the ministry as Pastor and Founder of Outreach Christian Center (OCC). Pastor Swinney holds a Doctor of Divinity Degree from Omega Bible Institute and Seminary, an Associate Diploma in Bible Studies and an International Multi-Denominational Certificate in Studies in Biblical Counseling from Grace Bible College. 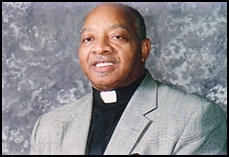 He received Credentials of Minister from the Universal Life Church, Inc. and Ordination through The Living Word, Inc.
Pastor Swinney has been a compelling leader and pastor in the ministry of the gospel of Jesus Christ since 1982. He has acquired over thirty years of dedication, spiritual leadership, and pastoral duties in shepherding the souls of the people. Pastor Swinney's unique and powerful teaching techniques continue to capture all hearts, as the Word is easily understood from the youngest to the oldest listener. He has authored hundreds of lessons, books and papers on the authority of the believer such as "The Leadership Workshop", "How to Witness Without Ulcers", and "Thorns of Grace" including his published work titled the "Marriage Survival Pack" revealing marriage building techniques using over fifty years of marital experience and knowledge. Performing as the entire band for the praise service in the church's early beginnings, Pastor Swinney continues to utilize his musical gifts in the worship services and also during various church programs. Pastor Swinney is surrounded with the love and support of his entire family: his wife, two daughters, and son all work full time in the ministry with Outreach Christian Center Academy and Dimensions Foundation Center.